If you can get your required amount of daily vitamins, minerals, fiber, and protein from foods instead of supplements that’s ideal. But this can be a challenge, even for those who eat a fairly well-balanced diet—and especially among older Americans. You need essential amino acids in your diet, as your body does not have the ability to make them on its own. Fortunately, many foods contain essential amino acids, such as eggs, meat, and fish. However, taking an essential amino acid supplement will allow you to synthesize protein more efficiently and help you build lean muscle mass faster. Protein is broken down into amino acids when you eat it, which are then used to help you build muscle, repair tissues, support bone health, and much more. As you age, your ability to build muscle mass deteriorates, which can impair mobility and strength. Stomach acid is required for the body to absorb vitamin B12 from food. But during your 50s, stomach acid begins to decline, which can make it harder for your body to absorb B12 from foods. You should have your B12 levels checked to determine if you are getting enough vitamin B12, and take a supplement if necessary. Even a minor B12 deficiency can put someone at a higher risk for dementia. Consider taking a B12 supplement with a slow dissolve formula. For best absorption of B12 into the body, seek out tablets that are meant to be placed under the tongue rather than swallowed. Probiotics are live bacteria that are good for your digestive system. You need “friendly” bacteria in your gut to stay healthy and properly absorb nutrients. Probiotics can help reintroduce good bacteria and are often found in fermented food like sauerkraut and yogurt. You can also take probiotics in a pill form. If you have digestive issues such as irritable bowel syndrome or diarrhea, you may benefit from probiotics. Omega-3 fatty acids are the kind of fats you don’t want to cut from your diet because they deliver a variety of important health benefits. Omega-3s may help protect you from heart disease while aiding in curbing stiffness and joint pain. Omega-3s are found in certain fish such as salmon, as well as in walnuts and flax seed oil. If you aren’t a fan of fish or don’t consume it regularly, a supplement may be your best option. Zinc is a micronutrient, but it’s an important component of your diet because it helps fight infections and inflammation. Older adults tend to get less zinc in their diets and absorb less of what they do consume. Signs of a zinc deficiency may include poor wound healing, a decline in immune system functioning, and unnatural hair loss. Oysters are one of the best sources of zinc, but since it’s unlikely you’re eating them on a regular basis you may need a zinc supplement. That said, whether you think you could benefit from a zinc supplement, amino acid supplement, or any other supplement, talk to your doctor first. There are 20 primary amino acids found in your body’s proteins—nine of which are considered essential to your diet because your cells cannot make them. 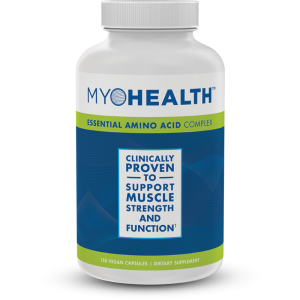 The only U.S.-patented product to provide all nine essential amino acids is called MyoHealth Essential Amino Acid Complex, which is sold by TriVita. TriVita offers a complete line of premium science-based nutritional supplements, including essential amino acid supplements, designed to support a healthy body and address a range of health concerns. In 1999, TriVita was founded by Michael Ellison, whose goal was to provide people with resources and inspiration to create lasting wellness.